Is Healthcare Communications Putting its Own Future at Risk? 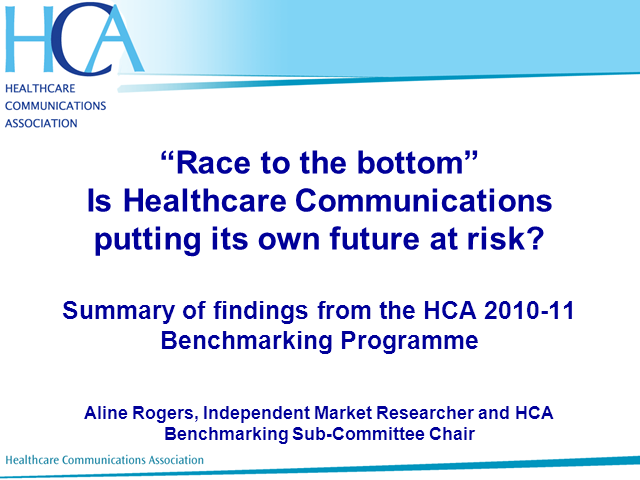 The Healthcare Communications Association (HCA) runs an annual Agency Benchmarking Survey to track trends in provision of healthcare communications services to the pharmaceutical industry. Activity patterns are changing, with a shift towards digital communications, more work being done in specialist areas such as market access and public affairs and a move away from traditional brand PR towards the unbranded/medical education end of the spectrum. Meeting these new challenges requires investment in staff and resources, at a time when consultanciesÃ¢ÂÂ profit margins are increasingly under pressure as clients look to squeeze more from their budgets. The latest HCA report contains some stark findings that illustrate the threats our industry faces if a cost-containment approach is allowed to dominate decision-making. If the trend is allowed to continue it could lead to healthcare communications becoming a devalued commodity and everyone losing out. In this fast-paced session, Econsultancy's VP of Research for the Americas, Stefan Tornquist, will share findings from a recent study conducted in partnership with Ogilvy CommonHealth. The research look at how healthcare companies are adapting to a more digital consumer and business environment. Topics include how marketing is organized, the state of digital capabilities in HC, use of data and how to foster innovation. So, we are finally at a point where with some certainty we can confirm we are in a digital world (this may have been true for some years in most industries – but is certainly truer in healthcare than ever before)… which means in terms of innovation within sales, within marketing, even within communicating effectively – digital is at the heart of making things work better. What does this mean for pharma, is our industry keeping pace, ahead of the curve or playing catch-up – what does this mean in terms of how pharma interacts with its customers, particularly doctors – who are ever more connected digitally with their customers – patients…. What do they need? 2. How is the doctor patient relationship changing in the evolving digital healthcare environment? 3. Why physicians need pharma to be more innovative in its communications. The pharmaceutical industry has made great strides in adopting new technology tools such as social media and mobile apps to communicate with healthcare professionals, consumers, patients, policymakers, and payers. The next frontier is to master these tools in order to improve health outcomes. Are you using email to extend the engagement of your live audiences, capture on-demand viewings and keep your subscribers actively interacting with your content over time? Join this presentation to learn how you can craft an email journey that will generate webinar leads, nurture prospects and build customer trust and loyalty for your business. We’ve come a long way from the Wild Wild West of sales and marketing efforts, where we were shooting blind and straight from the hip. It used to be that customer intelligence and behavior insights were slim pickings. Sales and marketing teams worked largely independently of each other – marketing established the brand messaging, while sales focused on prospecting and closing deals. The Wild Wild West has now become the Online Globe – disruptive technology advancements have revolutionized the way buyers make purchasing decisions and have drastically shifted how companies engage with buyers. A disjointed approach to sales and marketing doesn't cut it anymore. Discover how you can integrate your marketing and sales systems for better engagement with your buyers and improve lead conversion. Act-On’s Chief Marketing Officer, Atri Chatterjee, will discuss how you can leverage customer intelligence and insights to build a consistent and compelling marketing program that closely ties into your sales objectives to not only turn more prospects into customers, but also help you better engage with customers to increase their loyalty and commitment to your products or services. The world has changed—we are living in the most challenging financial times in history. In order to achieve sustainable business growth you need to know your customers better than anyone else and meet their needs at the deepest level by constantly adding value. Does your business have the unfair competitive advantage it takes to not just survive but thrive? Watch this session as Tony Robbins explores how to add more value to your customers through constant and never ending innovation and marketing. For over 35 years, Anthony Robbins has helped people to breakthrough and take their lives to another level — in their businesses, personal finance, families, careers and health. More than 50 million people in 100 nations have used his powerful strategies of leadership psychology, negotiation, business turnarounds and peak performance to create an extraordinary quality of life. The creator of the #1 personal and professional development system of all time, Robbins has been honored by Accenture as one of the “Top 50 Business Intellectuals in the World,” and by American Express and Harvard Business School as one of the top business leaders in the world. Customers have become increasingly empowered and discerning through technology. They no longer let brand owners, retailers, or mass media dictate their agenda. So accommodating customers today is more challenging for marketers than ever before. This webinar focuses on the strategic dimensions and success factors for engaging customers across discreet yet interconnected marketing channels. The emphasis includes: (1) perspectives on effective multichannel strategy, (2) frameworks for building omni-channel architecture, and (3) tools for equipping organizations to deliver brand designed experiences across channels . . . seamlessly. The takeaway will be a better understanding of how to develop & deploy multichannel strategies in a fiscally responsible way that fits your business model, brand positioning, and organizational culture. Are you guilty of content dumping? Join Christine Crandell, President of New Business Strategies as she discusses the real numbers your marketing team should be accountable for. Alex’s background as a journalist fuels her passion and creativity as a storyteller. It’s the secret weapon behind the successful content marketing campaigns, winning demand generation programs, and engaging social media efforts she has lead for startups, nonprofits, and Fortune 500 companies. Truly compelling stories transcend any medium and move audiences to buy, engage, and connect. Alex has successfully translated compelling stories to video, blogs, tweets, website copy – and helps Channel Maven clients do the same. With more than a decade of experience as a technology journalist, Alex’s writing has appeared all over the web and in print, including: PC World, Wired, CNN, CIO, The Houston Chronicle, TechSoup, Silicon Angle, ComputerWorld, Micro Publishing News, ARN, and Linux Today. Social business represents a new transformational opportunity for organizations. After initial forays into external social media, many companies are now discovering the value of applying social approaches, internally as well as externally. Social business can create valued customer experiences, increase workforce productivity and effectiveness and accelerate innovation. But many companies still wrestle with the organisational and cultural challenges posed by these new ways of work. Join this webinar to hear the proven results from easily integrating social into your everyday tools to improve your business. Chris Moore is a Social Business Specialist for IBM Collaboration Solutions. He has 7 years experience and knowledge of Collaboration and Exceptional Web Experience technologies; including IBM Notes, Domino, Sametime, Connections, Docs and Web Experience Suites. In this webinar John Sweeneyprovides a Case Study on how DemandGen uses video and webinar as part of its marketing strategy. DemandGen, the world’s largest Integrated Lead Management consultancy, use video and webinar content to generate names, nurture leads and close new business. This webinar will describe the role video and webinars play in the company’s lead management process and the progression of prospects the through the Demand Funnel. John Sweeney, Managing Director of DemandGen UK, will share insights on how best to combine video and webinars into a demand generation activities and provide examples of how to use video and webinar effectively. Running content marketing programs can be daunting, specifically for organizations that are running content marketing programs for the first time. This webinar will take you through the steps needed to launch and run a consistent stream of content through webinars and videos. As well as being littered with case studies and examples of 'top notch' programs this session will also share those much needed practical tips and quick wins to get you on your way to a successful program of events. Patricia Page, Marketing Programme Manager EMEA at BrightTALK, has been focused for the passed three years on initiating such content programmes and working with clients across finance and technology industries to help them develop their own content marketing plans with exceptional results. Quoc-Thai Dang, Demand Generation Marketing Manager, BrightTALK is focused on using webinars and videos to drive highly engaged sales-qualified leads for BrightTALK . He will be sharing his expertise and insights on how to target specific audiences for successful program outcomes. "Pharma's Social Media Trials and Tribulations"
The pharmaceutical industry is at a turning point in its adoption of new social media tools and applications for communication with healthcare professionals, consumers, patients, policymakers, and payers. Practically every pharmaceutical company has launched a social media project or application of one sort or another. To be sure, not all these efforts have been successful. This presentation will explore what worked and what didn't by highlighting the major trials and tribulations of pharma's social media "road trip"
History of FDA's Promise to Provide Social Media Guidelines. What's Gumming Up the Works? The Major Milestones of Pharma Use of Social Media: The Good, the Bad, and the Ugly. All Offer Useful Lessons. Just because it is cheaper to launch a Website, Facebook page or Twitter Account, it doesn't mean that the pharmaceutical industry will shift more promotional dollars to the digital realm. In fact, recent data and news stories provide indications that the recession in pharma digital spending is already here and the cause is patent expirations of major drugs. Despite a recent slight increase in overall direct-to-consumer spending by pharma in the first three quarters of 2011 vs 2010, WebMD suffered weak earnings due to pharmaceutical companies Âholding back on spending as they deal with expiring drug patents. Search advertising is also suffering from the patent cliff syndrome: a representative of Google recently implied that pharma is not currently leveraging the Internet and the drug industry was not considered a "key client by Google because of it's low spend." This is counterintuitive. Digital tools can help pharma companies survive the patent cliff if they use these tools to focus more on patient education and support rather than on branded messaging. Pharmaguy (@pharmaguy)- also known as John Mack - is the Publisher and Editor of Pharma Marketing News, an independent monthly electronic newsletter focused on issues of importance to pharmaceutical marketing executives. Pharmaguy is also an accomplished blogger. In January 2005, he created Pharma Marketing Blog (www.pharmamarketingblog.com), which focuses on commentary about topical pharmaceutical marketing issues. Pharma Marketing Blog was cited by the Wall Street Journal as a blog "insiders read to stay current"Â and by MedAdNews as "...often-entertaining, always informative..."
This presentation proposes that the current model by which materials and activities are generated and "approved" for use with health professionals and the public is deeply flawed and has been exposed as such by the revolution in social media. The presentation will touch on social media guidance from both the PMCPA and FDA as well as considering changes in Europe that are underway with respect to communication of information to patients. The aim of the presentation is to demonstrate that effective action in social media by pharma is within everyone's grasp if they apply some basic principle of thought and have the courage to act. As the Government’s ‘listening exercise’ continues – have your say on how the NHS reforms should be altered. Will more changes simply alienate a different group of stakeholders – or is there hope that this pause will allow the Healthcare Bill to be improved? Put your questions and opinions to our panel. How will your job be affected? Is this really about improving patient services or is there another agenda? Join the discussion and have your say. Current reforms to the NHS have been challenged by the British Medical Association, the Nuffield Trust report and members of the coalition party. Join this webcast to hear Andrew Lansley, The Health Secretary, address concerns put to him by UK doctors who are being asked to play a central role in implementing these changes. In light of these recent reports, are these reforms necessary? Is it privatisation by the back door? Healthcare is undergoing a digital-led transformation, with patients having instant access to hundreds of seemingly credible healthcare and information resources. In this environment, patients can be confused about who to trust and where to turn for advice. Balancing the needs of patients with an organisation’s desire to promote its message can be difficult, but partnership working is delivering demonstrable benefits and helping achieve information ‘cut through’. This approach is going to become increasingly important as the healthcare market evolves, and in the UK, the localizing of commissioning to GP consortia makes it critical to form solid partnerships early, ready to address the new challenges. The Department of Health's updated cancer plan Improving Outcomes: a strategy for cancer published in January 2011, outlines a strategy to improve the outcomes for patients with cancer. The ambition to become the country with the best outcomes in Europe is a undoubtedly good, but the challenge is how to do this within the current economic constraints and the drive for "efficiency" improvements over the next 3 years. What are the the most important tactics to achieve earlier diagnosis, quick access to diagnostic tests and prompt referral to a specialist? How will the cancer drugs fund work? How will emerging GP consortia decide how to commission the best cancer services? Is the Department of Health's new TV and YouTube advertising campaign about the symptoms of bowel cancer going to help? Join Professor Sir Mike Richards National Cancer Director and Dr Clare Gerada, Chair of Royal College of General Practitioners as they outline their views and answer your questions. The Healthcare industry is in a state of flux. Companies, prescribers, practitioners and patients are facing changes on an unprecedented scale. What are companies and industry organisations doing to adapt to this new environment. Stay ahead by attending webcasts in this channel to interact with experts and thought leaders in the Healthcare industry. Title: Is Healthcare Communications Putting its Own Future at Risk?